I was invited to the Gwangju Design Biennale 2013 in Korea to the group exhibition for the Unification Flag of Korea. The exhibition calls for the joint entry of the North and South Korean teams at the Gwangju Universiade 2015. The exhibition features a new design for the unification flag. designers might take the lead in paving the way for peace on the Korean Peninsula. 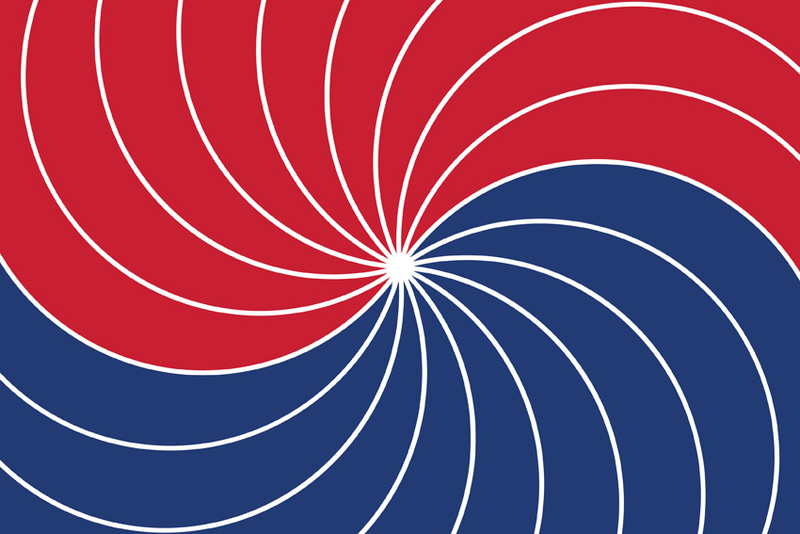 The Unified Flag for Two Koreas essentially starts from the belief that Taegeuk should constitute the principal part of Taegeukgi, the original Korean Flag. I thought that a comprehensive symbol for a unified nation should come before the emphasis on the wish for peace or geographical shape, and I further wanted to express the dynamism and pride of the Korean people through repetition of curves while maintaining the basic form of Taegeuk. The luminous shapes spewing from the center of yin and yang are the sun and the moon that rise and set in the land of Korea. The visual elements that conjure up the shape of a star and the design aspects like colors can be said to satisfy both South and North Korean flags.